Fees include lodging for one or two persons per room. Each additional person in the room is $20.00 each extra per night. This ground floor suite is our most spacious room. There is handicap access and a private porch. The room has two queen size beds, love sofa and antique armoire. The bath has a tub with shower. Satelite television with DVD player. Air conditioning. Coffee and maker. A spacious second floor room with a vaulted ceiling, view of McGee Creek with two queen size beds. The bath has tub with shower. Satellite television with DVD player. Air Conditioning. Coffee and maker. With a magnificent view of McGee Mountain and the Sierras, this room features one queen size bed, love sofa and a shower in the bath. Satellite television. Air conditioning. Coffee and maker. This second floor room has exquisite views of Crowley Lake, Glass Mountains, and the White Mountains. The room features one king size bed, a writing table with a view, love sofa and a luxury tub with shower. Satellite television. Air conditioning. Coffee and maker. With unique angles and character, this second floor room looks out on Nevada Ridge and the Sierras. The room has one queen size bed, love sofa. Bath has a shower. Satellite television. Air conditioning. Coffee and maker. 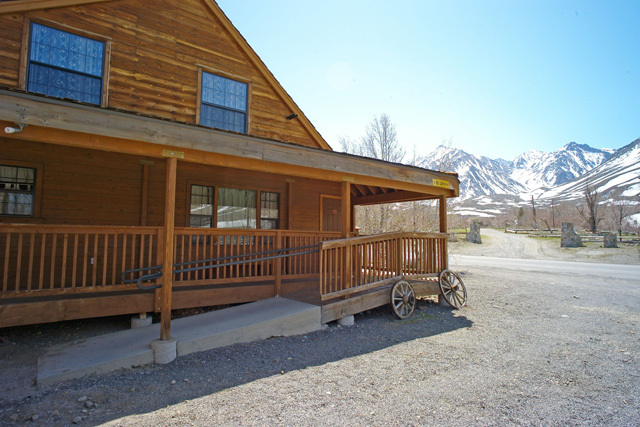 This second floor room has great views of Crowley Lake and the Glass and White Mountains. One twin and one double bed occupy this room. There is a writing table with a view and the bath has an oversize luxury tub with shower. Satellite television. Air conditioning. Coffee and maker. This second floor room has a view of the Sierras. Their are three beds and a love sofa, making this a great family room. The bath has tub and shower. Satellite television. Air conditioning. Coffee and maker. This room has an unobstructed view of Crowley Lake, the Glass and White Mountains. There is one king size bed, with a fabulous view from the bed, love sofa and an extra large shower with skylight. Satellite television. Air conditioning. Coffee and maker. The ‘Caretakers’ Cabin sits apart from the main Lodge for more privacy. It had a Temperpedic queen bed in the bedroom and a queen bed in the loft (access by ladder). The cabin has a comfortable living area with a full kitchen and a bath with shower. Satellite television with DVD player and stereo CD player. Espresso & coffee maker. Micro wave, refrigerator and stove with oven.